Students around the world study martial arts, many from early childhood through late adulthood. Practicing a martial arts lifestyle is often a demonstration of perseverance, determination and grit that requires both physical and psychological commitment. Your level of achievement is most often referred to as your rank. When you study martial arts, the rank you have earned is often indicated by the color of belt you are authorized to wear with your uniform. In most styles of practice, you begin your journey toward martial arts achievements wearing a white belt. Reaching the coveted rank of black belt is a significant milestone that takes years of dedicated practice. As you achieve higher ranks while working toward this goal, you change belts. The color of belt you wear with each advancement has special meaning and signifies your experience and progression. Perhaps you’ve been told in the past that the belt ranking system came from an ancient tradition of students of martial arts never washing their belts. According to this myth, beginning students were given white belts to signify the newness of their practice. As they studied, practiced and developed their skills over time, their belts would become soiled and stained with sweat, dirt and blood. Once their belts yellowed, darkened and finally became black, the students were said to be masters. Gaining a new belt is a major accomplishment for martial artists of all ages and disciplines. Many times, schools/dojos hold a special ceremony where advancing students are presented with their new belt. First off, can we all take a moment to acknowledge that this is really gross? In reality, the initial purpose of martial arts belts was simply to hold up students’ pants! Using belts as part of the ranking system didn’t evolve until the late 1880s, when the founder of judo, Jigoro Kano, introduced the concept in Japan. By the early 1900s, the idea had spread throughout many styles and schools around the world. Today, most forms of martial arts practice incorporate some form of colored belt ranking system to track students’ progress. There aren’t any universal standards governing how martial arts belt colors are defined. Each form of martial arts has its own traditions, rules and explanations, and there can be many variations even within the same style. However, regardless of how the rainbow in between them is colored, it is widely accepted that your first belt is white and your belt signifying mastery is black. Kano called this the Dan ranking system, and there are many levels of mastery beyond the first Dan black belt. In fact, the International Martial Arts Federation recognizes 10 levels. Reaching the degree of tenth Dan can take a lifetime to achieve. In Japanese tradition, the color white symbolizes death, while black symbolizes life. This relates to martial arts because you are invited as a white belt student to sacrifice your previous lifestyle for devotion to your practice. You are then reborn to conquer your fears and embrace your new life. In Korean tradition, white symbolizes the beginning of the life cycle, with black representing culmination. While they vary across disciplines, the colors in between signify various stages of growth and development. A common sequence of advancement by color is white, yellow, orange, green, blue, purple, brown, black, and red. 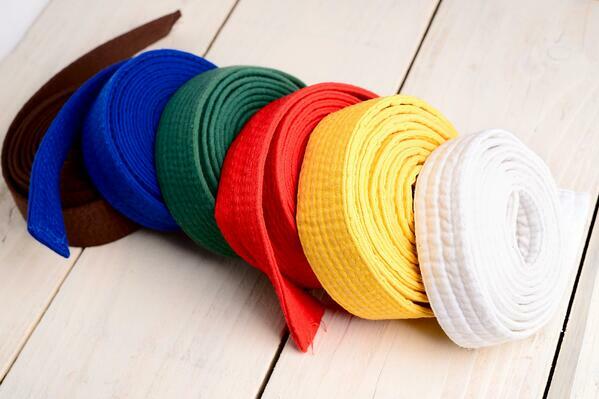 The martial arts belts at some schools are awarded in solid colors. In other schools, belts can also include stripes. Stripes are sometimes used to show “in-between” phases of training. For example, a white belt with a yellow stripe could mean that the student has been progressed beyond a standard white belt, but is not quite ready for a full yellow belt. As you advance in rank and replace a lower-ranking belt with a new color, your school may recognize your achievement with a belt tying ceremony. Whether or not this formality occurs, becoming eligible to wear a belt of a higher-ranking color indicates a rite of passage of which you can be proud. In some schools, your belt rank determines which types of training you are eligible for. For example, some schools may not let students spar until they have reached a certain rank. 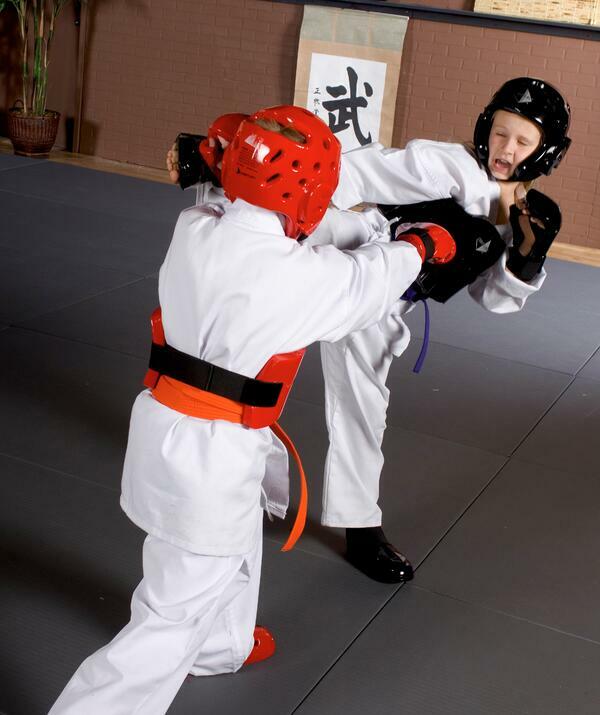 Here, an orange-belt child spars with a purple belt. Earning rank advancements means that you have demonstrated competence at increasingly more difficult levels of skill. It also means that you are setting an example of leadership for students who have not yet reached your level of accomplishment. If you are working toward a black belt, you can track how far away you are from this goal with the color of your belt, and you can look for guidance from fellow students who are further down the path. 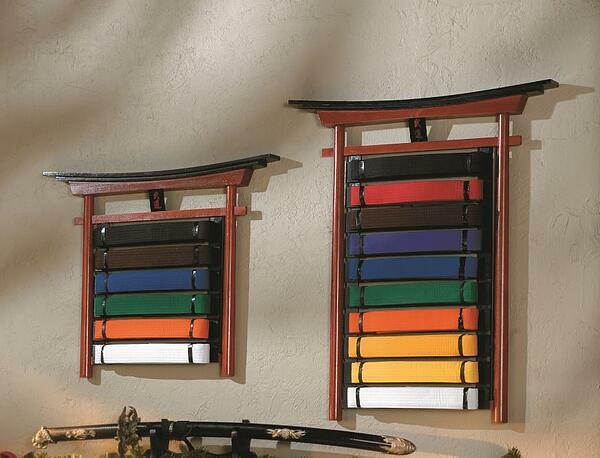 As you get closer to reaching your first Dan, the martial arts belt colors you see in your school can be a source of motivation and inspiration, pushing you ahead toward mastery.